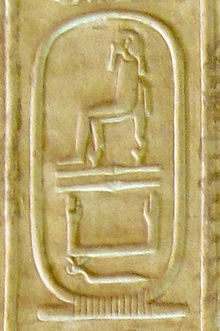 Shepseskaf's cartouche on the Abydos king list. Khentkaus I ? Bunefer ? Djedefptah ? Bunefer ? Khamaat ? Khamerernebty II ? Rekhetre ? Shepseskaf's family is uncertain. Egyptologist George Andrew Reisner proposed that Shepseskaf was Menkaure's son based on a decree mentioning that Shepseskaf completed Menkaure's mortuary temple. This however cannot be considered a solid proof of filiation since the decree does not describe the relationship between these two kings. Furthermore, the completion of the tomb of a deceased pharaoh by his successor does not necessarily depend on a direct father/son relation between the two. The mother, wives and children of Shepseskaf are unknown. If Menkaure was indeed his father, his mother could have been one of Menkaure's royal wives Khamerernebty II or Rekhetre. It's possible that Shepseskaf's wife was Khentkaus I, but this is far from certain. Queen Bunefer has been suggested as a possible wife of Shepseskaf based on the titles as a priestess of Shepseskhaf. She may however have been a daughter who served as a priestess in the cult for her father. Finally, Khamaat, the wife of a nobleman named Ptahshepses and daughter of a king, may be a daughter of Shepseskaf or Userkaf. He was likely the last pharaoh of the Fourth Dynasty of Egypt if he was not succeeded by a certain unknown ruler named Thamphthis as recorded in some Egyptian literature and, indirectly, by the Turin Canon. No ruler named Thamphthis is recorded in contemporary documents such as royal monuments or private tombs in the Old Kingdom cemeteries of Giza and Saqqara which date to this period. The long-lived palace courtier Netry-nesut-pu explicitly lists this sequence of Old Kingdom kings he served under in his tomb: Radjedef → Khafre → Menkaure → Shepseskaf, and the first three 5th dynasty kings namely Userkaf, Sahure and Neferirkare. Finally, "No names of estates of the period [which are] compounded with royal names make mention of any other kings than these, nor do the names of...royal grandchildren, who often bore the name of a royal ancestor as a component of their own [name]." Sekhemkare, a son of Khafra, priest of the royal funerary cults. His mastaba, located in Giza (G8154) yielded a list of the kings under whom he served, from Khafra down to Sahure through Shepseskaf. This list also gives Userkaf as the immediate successor to Shepseskaf. Bunefer, royal princess and priestess of Shepseskaf funerary cult, buried in Gizah (G8408). She is believed to be either one of Shepseskaf's wife, daughter or one of his sisters and to have participated in his burial ceremonies. Nisutpunetjer, who was a priest of the royal funerary cults. His mastaba in Giza (G8740) yielded a list of pharaohs under whom he served, from Djedefra down to Sahure and mentions Shepseskaf followed by Userkaf. Ptahshepses I, great priest of Ptah. An inscription on his false door stele details his biography. He relates that he was educated at court with Shepseskaf who later promoted him to the office of first priest of Ptah and gave him his daughter Khamaat for wedding. Kaunisut, a palace official, cites Shepseskaf in his mastaba at Gizah (G8960). 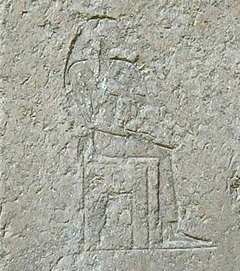 Other than these scanty references to Shepseskaf's reign, the only stele known today that is firmly datable to that period was uncovered in Menkaure's pyramid complex. It mentions a royal decree by Shepseskaf where he makes donations in favor of his father's mortuary cult. The Turin Canon ascribes Shepseskaf a rule of four years and his anonymous 4th dynasty successor—presumably a reference to Djedefptah—a reign of two years. In contrast, Manetho's King List explicitly gives Shepseskaf a reign of seven years which may be a combination of the 4 + 2 (= 6) full year figures noted in the Turin Kinglist for the last two kings of the Fourth Dynasty plus a significant monthly fraction. Manetho's King List does, however, also note the existence of the unknown and possibly fictitious ruler Djedefptah—called Thampthis in his records—who is ascribed a reign of nine years. The Palermo stone describes the first year of Shepseskaf's reign. Shepseskaf is confirmed as the immediate successor of Menkaure and was apparently crowned on the eleventh day of the fourth month. Analyses of the space available between the beginning of his reign and that of his successor indicate that Shepseskaf did not reign more than seven years. Finally, the Palermo stone indicates that the emplacement and name of Shepseskaf's tomb were chosen during his first year on the throne. The name of the tomb is written with the determinative of a pyramid. Shepseskaf's tomb is a great mastaba at Saqqara, which was originally called Shepseskaf is purified and is now known as Mastabat al-Fir’aun. This mastaba was first recognized as such by Richard Lepsius in the mid 19th century and was first excavated in 1858 by Auguste Mariette. However it was not before the years 1924-1925 that the mastaba was thoroughly explored by Gustave Jéquier. The mastaba was initially thought to be the tomb of the 5th dynasty king Unas, but Jéquier discovered evidence that it belonged to Shepseskaf. In particular, he uncovered a Middle Kingdom stele indicating that Shepseskaf mortuary cult was still active onsite during this time period. Shepseskaf may have designed a smaller tomb for himself because he was faced with the arduous task of completing his father's pyramid at Giza while simultaneously building his own tomb, at a time where Egypt was less prosperous than during the early 4th dynasty. Shepseskaf may have chosen to build a mastaba at Saqqara, rather than a pyramid at Gizah, to undermine the growing influence of the priesthood of Re. This hypothesis could also explain the absence of any reference to Re in his name as well as that of his probable immediate successor Userkaf. Shepseskaf chose to build a mastaba following the archaic tradition of the first, second and early third dynasties. Shepseskaf initially planned to build himself a pyramid, as hinted by the Palermo stone, but died shortly after work had started. Consequently, his successor or his queen may have finished the tomb as a mastaba rather than pyramid. ^ a b Thomas Schneider: Lexikon der Pharaonen. Albatros, Düsseldorf 2002, ISBN 3-491-96053-3, page 248. ^ Alan H. Gardiner: The royal canon of Turin, Griffith Institute, Oxford (UK) 1997, ISBN 0-900416-48-3, page 16; table II. njswt sA.t n Xt f, royal daughter of his body, which was found in her tomb in Gizah. Lepsius, Karl Richard. Denkmäler aus Ægypten und Æthiopen - volume I. Leipzig. KRL. Gauthier, Henri (1925). Annales du service des antiquités de l'Égypte. Cairo. HG. Hassan, Selim (1936). Excavations at Gîza II, 1930-1931. Cairo. SHA. Hassan, Selim (1941). Excavations at Gîza III, 1931-1932. Cairo. SH. Grimal, Nicolas. Histoire de l'Égypte ancienne. Wikimedia Commons has media related to Shepseskaf. Unas or Wenis, also spelled Unis, was a pharaoh, the ninth and last ruler of the Fifth Dynasty of Egypt during the Old Kingdom. Unas reigned for 15 to 30 years in the mid-24th century BC, succeeding Djedkare Isesi, who might have been his father. Saqqara, also spelled Sakkara or Saccara in English, is a vast, ancient burial ground in Egypt, serving as the necropolis for the Ancient Egyptian capital, Memphis. 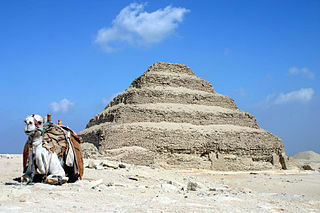 Saqqara features numerous pyramids, including the world-famous Step pyramid of Djoser, sometimes referred to as the Step Tomb due to its rectangular base, as well as a number of mastabas. Located some 30 km (19 mi) south of modern-day Cairo, Saqqara covers an area of around 7 by 1.5 km. Menkaure, was an ancient Egyptian king (pharaoh) of the 4th dynasty during the Old Kingdom, who is well known under his Hellenized names Mykerinos and Menkheres. According to Manetho, he was the throne successor of king Bikheris, but according to archaeological evidences he rather was the successor of king Khafre. Menkaure became famous for his tomb, the Pyramid of Menkaure, at Giza and his beautiful statue triads, showing the king together with his wives Rekhetre and Khamerernebty. Neferirkare Kakai was an ancient Egyptian pharaoh, the third king of the Fifth Dynasty. Neferirkare, the eldest son of Sahure with his consort Meretnebty, was known as Ranefer A before he came to the throne. He acceded the day after his father's death and reigned for eight to eleven years, sometime in the early to mid-25th century BCE. He was himself very likely succeeded by his eldest son, born of his queen Khentkaus II, the prince Ranefer B who would take the throne as king Neferefre. Neferirkare fathered another pharaoh, Nyuserre Ini, who took the throne after Neferefre's short reign and the brief rule of the poorly known Shepseskare. Menkauhor Kaiu was an Ancient Egyptian pharaoh of the Old Kingdom period. He was the seventh ruler of the Fifth Dynasty at the end of the 25th century BC or early in the 24th century BC. Shepseskare or Shepseskara was an Ancient Egyptian pharaoh, the fourth or fifth ruler of the Fifth Dynasty during the Old Kingdom period. Shepseskare lived in the mid-25th century BC and was probably the owner of an unfinished pyramid in Abusir, which was abandoned after a few weeks of work in the earliest stages of its construction. The pyramid complex of Userkaf was built c. 2490 BC for the pharaoh Userkaf, founder of the 5th dynasty of Egypt. It is located in the pyramid field at Saqqara, on the north-east of the step pyramid of Djoser. Constructed in dressed stone with a core of rubble, the pyramid is now ruined and resembles a conical hill in the sands of Saqqara. For this reason, it is known locally as El-Haram el-Maharbish, the "Heap of Stone" and was recognized as a royal pyramid by western archaeologists in the 19th century. Khentkaus I, also referred to as Khentkawes, was a royal woman who lived in ancient Egypt during the Fourth and the Fifth Dynasties. She may have been a daughter of king Menkaure, the wife of both king Shepseskaf and king Userkaf, the mother of king Sahure, and perhaps, in her own right, the king of Upper and Lower Egypt. Her Mastaba at Giza – tomb LG100 – is located very close to Menkaure's pyramid complex. 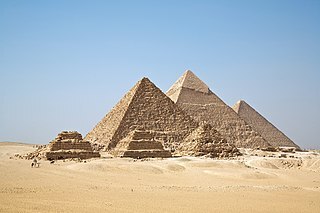 This close connection may point to a family relationship, but the relationship is not clear, but the proximity of the pyramid complex of Khentkaus to that of king Menkaure has led to the conjecture that she may have been his daughter. Bikheris is the Hellenized name of an Ancient Egyptian pharaoh, who may have ruled during the 4th Dynasty around 2570 BC. Next to nothing is known about this ruler and some Egyptologists even believe him to be fictitious.